Every VW has a key. Some have more than others do. When your VW was delivered from the factory, one key unlocked everything you needed to unlock. Over the years, though, Â many parts have usually been changed, and one key may not work all your locks anymore. Or, suppose you lost the key to your car, and had to have a new one made. Perhaps you just bought a project Split or Oval, (or Type II or Type III), and it came without any keys whatsoever. Whaddya gonna do? Gabriel Garcia, of Gabriel’s Keys & Locks, got into his profession purely by necessity. He had bought a 23-Window Bus, and with that Bus came five different keys to open and lock everthing. He took all the handles and switches out and began to take them apart and play with them. Soon, after a few attempts (and broken locks) he had one key fitting all the locks on his 23-Window Bus. Â Soon, after telling all his friends what he was able to do, they all wanted him to do the same thing with their cars as well. From these humble beginnings Gabriel’s VW Keys and Locks was born. 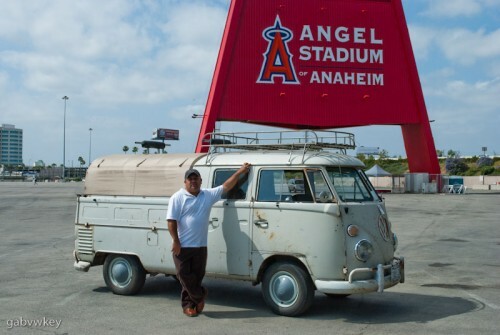 VW Trends paid a visit to Gabriel in Stockton, Calif., to view his operation and throw him a few curve balls, just to see how good he really was and if he could really make a key from mailing order, as he claimed he could. Gabriel has key blanks for every VW from 1936 to the mid-1980’s. You need an original “Huf” brand key for your Split? Â No problem. Gabriel has lots of them. How about an “SG” or “SC’ profile key for your Oval? Sure, how many do you need? If VW made it, Gabriel can make a key for it. His collection of original VW key blanks is impressive, to say the least. Suppose you have a VW like Gabriel’s 23-Window Bus, which takes almost a half dozen keys to open everything up? No big deal, just send gabriel your door handles, “T” handle, ignition switch and whatever else needs a key, and you will get them back rebuilt with one key fitting everything. The guide pins loose or shot in your 1967-one year only Sedan door handles? Piece of cake for Gabriel. Maybe you got an original shifter lock with no key-which everyone says can’t be broken into and re-keyed? Send it to Gabriel. Gabriel has been known to make an order over the phone and “two day express” mail a key to South Africa! If you are at a show in the california area, you will probably find Gabriel set up in the swap meet area, making keys to order. Anthony De la Torre, aka “Cub” from Hardtop Sedan at the swap meet and it didn’t come with any keys. C.B. Performance, found out just how good Gabriel is at the Sacramento Bugorama. Anthony purchased a very nice ’67 Hardtop Sedan at the swap meet and it didn’t come with any keys. He simply took the door handle off, gave it to Gabriel (who was set up right near the area where Anthony bought the car), and in 10 minutes he had a car that would lock and start with the same key. Here’s another example. My good friend russ Hare had just recently bought a 1960 Beetle Convertible and he was quite happy to find that one key worked the door handles, the ignition, the glove box lock, the hood release lock, and the “T” handle decklid lock. Unfortunately, one day at work, Russ found himself without a key. I got Russ on the phone while I was at Gabriel’s VW Keys and Locks and Gabriel told Russ where to look for the lock code number, which Russ found and relayed to Gabriel over the phone. Ten minutes later, I had a key to take home to Russ, and true to Gabriel’s expertise, that one key fit all the locks and ignition switch on Russ’ Vert. Gabriel can usually offer a 2-3 day turn around time and can really get moving if there’s an emergency, such as a car without keys stuck in a neighborhood where you don’t want the car left outside. He can “next-day air” you a key, if you have a car that needs to be at a show that weekend, or something of that nature. If it has tumblers, Gabriel can fix it. As a side note, Gabriel does not do Chevys, Fords, Hondas or anything else. He does VW keys, period. No house keys, no padlocks, just VWs. If you have anything of a VW key nature that needs to be attended to, whether it is just a spare set of keys for your pride and joy, or you need a key made via mail-order to get that project car started, Gabriel is the man for the job!